I’m driving along the road from Moretonhampstead, an exercise in narrow twisty lanes and dodging big puddles of standing rainwater, none of which makes me especially hopeful for the likely conditions underfoot this weekend. But as I climb up and enter the National Park proper, new feelings take over. 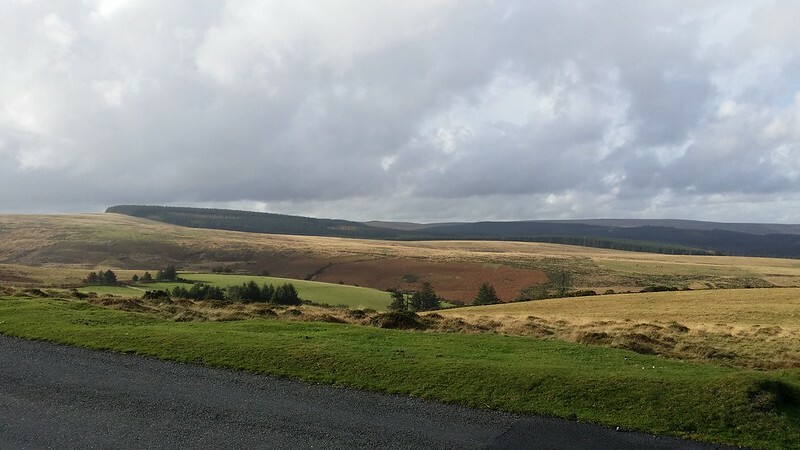 Suddenly the confines of country lanes are replaced by big open moorland and a view of distant ridges, trees and tors, all under what is commonly called a “big sky”. I pull into the first roadside parking area I come to, switch off the engine and step out of the car just as a huge whooshing roar of a Typhoon fighter plane passes overhead and disappears over the distant tors. I spend a few minutes looking across to the extensive Fernworthy Forest, above which I might be camping on Sunday night, if the weather, our walk plans and my inclination allows. Then it’s back into the car as I’m eager to get to Princetown to get the weekend started. I’m eager as it’s several years since I last came to Dartmoor, the allure of which has built in my mind over recent months seeing the antics of various online friends in the Park. This weekend is quite openly planned to draw a group of new initiates into the obsessive embrace of the moor, our guides to be those already under its spell. I’m open to the possibility but at the same time harbouring concerns that I may end up spreading myself thin considering how much Lake District and Wales there’s still left to explore. The tragedy of it all is that for 7 years I lived within a short drive of Dartmoor, and failed to make use of it. Tinkering around the edges visiting Lydford Gorge and Castle Drogo, maybe a couple of drives over the moor itself, without putting a foot on grass or bracken. In particular, all those drives below the southern edge of Dartmoor on work trips to Plymouth. 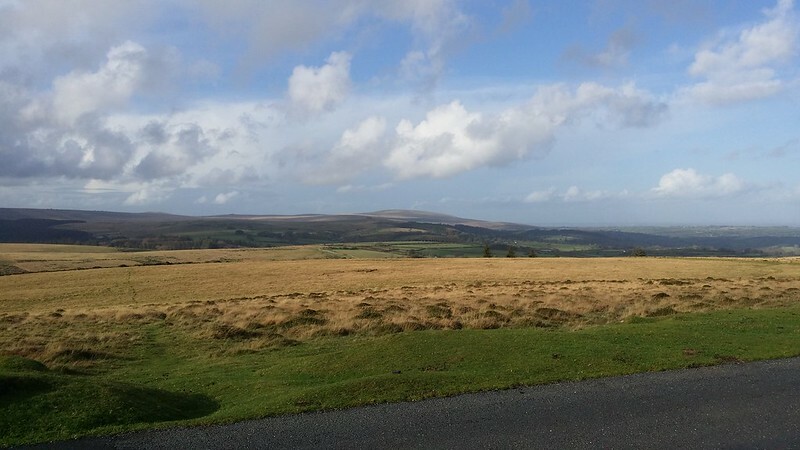 A massive opportunity gone to waste – especially if it turns out that I like Dartmoor. The only time I have walked on the Moor was in 2008, when we had our annual family camping holiday just outside of Tavistock. I spent a day walking from Meldon Reservoir back to the campsite, picking off the Nuttalls that I was focussed on ticking off at that time. After bagging all of the high stuff, the route home caused some problems – a navigational error when I got to Lynch Tor and dwindling water supplies on a very hot day. I was still out on the Moor at 8pm finding myself the wrong side of White Tor if I wanted to avoid a lengthy road walk. After climbing over the Tor, I arrived back at the campsite after dark, just before the search and rescue team were called out. A less demanding walk finished that trip when we stopped off on the drive home at Hound Tor, the whole family trotting up to the rocks from the ice cream van. I made a video of it and submitted it in LFTO’s annual competition. It obviously wasn’t good enough to get a prize, but did at least get a mention as one of the videos of the week. And so, I’m keen to see what all the fuss is about: why Paul loves Dartmoor so much that he willingly does the 5 hour drive each way for a weekend of walking; why he’s trying to bag all of the tors and major rocks rather than more popular lists such as Wainwrights, Munros or Nuttalls. Surely, he must be mad. Why too, has Phil accompanied him on a number of these trips and remains keen to keep doing so. There must be some sort of magic amongst these windswept outcrops of granite. I’m the first to arrive at the Plume of Feathers, our base for the weekend. I’m not surprised: I did set off at 7am and it’s still technically lunchtime. Another Typhoon, or two, thunder unseen overhead as I park up and check-in to the bunkhouse, having the pick of the beds. Then it’s off to explore the streets of Princetown, partly to see what it has to offer (not much) and partly to kill time (quite a lot). The bulk of the time is spent in two places – firstly the National Park Visitor Centre. There I have a good look at the leaflets and merchandise on offer, but reserve the bulk of my time for the photographic expedition which seems to consist mainly of lumps of granite with sunrises and sunsets behind them. At this stage they all look too similar to each other – one tor still looks much like another, but I’m sure that will change. The second time-killer is the Fox Tor Café, conveniently located right by the pub. Paul seems to spend a lot of time in here, so I step inside to see what all the fuss is about. My initial reaction is favourable – it’s clearly one of those cafes you find in upland walking areas where a café is combined with outdoor shop, off licence and local produce shop. I further my research by conducting some important quality testing of their cream tea, which passes muster. No sign of anyone, and a text from Cath tells me that her, Dean and Phil are still in Somerset, so I head back to the bunkhouse and sort my stuff out. After a while, Paul turns up and introduces me to Jim. We spend a little while poring over maps and the Dartmoor Tors and Rocks book. Jim is practicing for his ML qualification (as I suppose I probably should be too), and becomes our leader for the walks this weekend. Cath, Dean and Phil arrive and we adjourn to the pub, catching up with each other since we were last together for the 10-in-10 in June. Dinner is ordered and the various ales of Dartmoor Brewery are subjected to similar quality control testing as the cream tea earlier. Favouring the darker Dragon’s Breath over the staff-recommended Jail Ale, in the interests of science I try both, concluding that I was right all along and the Dragon’s Breath is superior. Dean agrees with me, but a second pint of the good stuff is required to confirm the results of the testing. And I noticed that the Plume of Feathers also has a doggy menu. As in a menu for dogs, not a menu consisting of dogs! Dartmoor is fab for wild camping! I can see that and the whole day was scouting out possible spots. 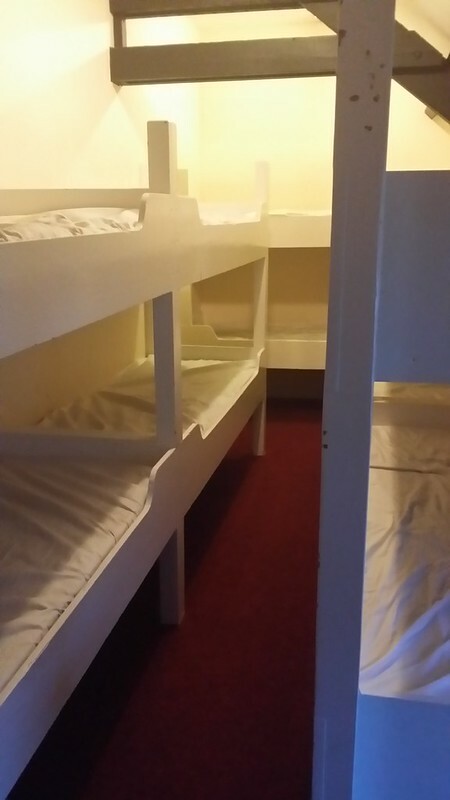 We’d originally planned to camp but as the group size grew and the forecast looked more and more unsettled we opted for the bunkhouse option this time around. I did however pack my Scarp in case I felt like a camp on the Sunday – everyone else was going home then so I potentially had an opportunity to squeeze one in. The poor forecast, the prospect of a long night and coming down with a bug decided me against it in the end. Next time though…. Dartmoor is one of my favourite locations and relatively close too! Never been to Dartmoor need to rectify this, thanks. Ha, all part of my devilish plot to empty the Lakes so I can find some solitude there! !